XXL Size Question. Max Z height? Sorry if this question has already been answered. I am designing a work bench for the XXL and wondered if anyone can confirm the dimensions on the sales page? My concern is mostly the max Z height of the machine (not cutting area), wondering if the brand of router can make a difference. 40 1/4" (Y-axis) Front to back (from outside of black bracket on each end). 44 13/16" (X-axis) Left to Right (from outside of black bracket on each end). Note: The little adjustable feet that you’ll attached to the bottom are set in somewhat, away from the outermost edge. So the footprint (Y x X) is slightly smaller than my measurements above. Z-axis height - I’m using the DeWalt router. From the top of the wasteboard to the button of the router chuck (no bit installed) the measurement is 4 1/16". Variables I notice are that the chuck height changes slightly once tightened with bit installed. Other variable is bit size. They vary in length and by how much of the bit will/can fit inside the chuck. I have a 5/8" spoilboard and the allowance with that installed is 3 7/16". Yours may be more or less. Then, you’ll account for your stock material (what you are cutting). Hope this helps. Let me know if I missed something. Brian, Thank you for the information! This helps a ton with the table size. Now I am specifically looking for overall height of the machine. This will be sort of a table / enclosure and I need to know how tall the thing can be. 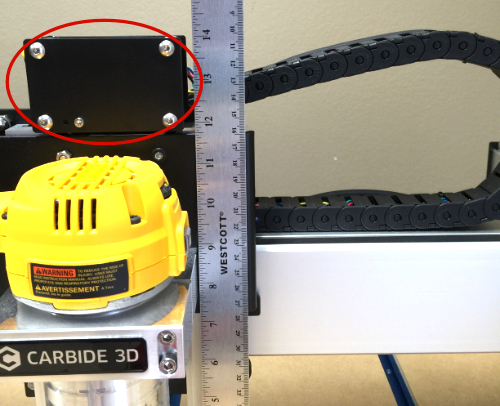 when the Z axis is fully retracted, how tall is the machine? @shelbycharged - The total height of mine, from table top to the top of the z-axis is 16 (7/16)". Again, one variable is the adjustable feet. Mine are set fairly high. That’s good for this discussion because it’s giving you closer to an absolute max height. Also, here is a pic of the z-axis top. Shows a ruler measuring 14". That’s from the top of my spoilboard to the top of the z-axis. I added measurement from table top to spoilboard top to 14" to get the total number 16 (7/16)". The photo also helps show that the overall machine height is the same regardless of spindle height. The section inside the red oval (added by me) is stationary on the z-axis. It does not go up/down. The whole section just below that is what moves with the spindle. Also, you can see my drag chain to the right actually sticks above that slightly. Partly due to how I fastened my router power cable to it, which is not the most flexible thing. Yours may lay flatter once bent. This should give you enough to build your enclosure. Hope you’ll share that on the forum when it’s complete. I am planning to build once soon and appreciate all the options and styles people offer.